Sunday Times Top Ten Bestseller ‘You fail to read this book at your peril’ – Admiral James G Stavridis, US Navy, former Supreme Allied Commander Europe. 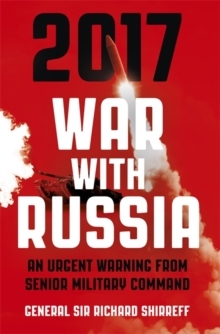 Closely modelled on his NATO experience of war gaming future conflicts, 2017 War With Russia is a chilling account of where we are heading if we fail to recognise the threat posed by the Russian president. Written by the recently retired Deputy Supreme Allied Commander Europe and endorsed by senior military figures, this book shows how war with Russia could erupt with the bloodiest and most appalling consequences if the necessary steps are not taken urgently. President Putin said: ‘We have all the reasons to believe that the policy of containment of Russia which was happening in the 18th, 19th and 20th century is still going on…’ And ‘If you press the spring, it will release at some point. Something you should remember.’ Like any ‘strongman’, the Russian president’s reputation for strength is everything. Lose momentum, fail to give the people what they want and he fails. The President has already demonstrated that he has no intention of failing. He has already started a lethal dynamic which, unless checked right now, could see him invade the Baltic states. Russia’s invasion and seizure of Georgia in 2008 was our ‘Rhineland moment’. We ignored the warning signs – as we did back in the 1930s – and we made it ‘business as usual’. Crimea in 2014 was the President’s ‘Sudetenland moment’ and again he got away with it. Since 2014 Russia has invaded Ukraine. The Baltics could be next. Our political leaders assume that nuclear deterrence will save us. General Sir Richard Shirreff shows us why this will not wash.